Our policies are created to maximise your enjoyment and benefit. Prayer Deliverance Ministries (PDM) values the privacy of all site visitors and clients and does not provide individually identifiable information to third parties. Prayer Deliverance Ministries (PDM) is the sole owner of the information collected on any website that is owned and operated by Prayer Deliverance Ministries. Prayer Deliverance Ministries (PDM) collects information from our users at several different points on our Web sites. Prayer Deliverance Ministries (PDM) will not sell, lease or rent personal information acquired within our web site. No personal information will be gathered without your knowledge and permission. Prayer Deliverance Ministries (PDM) will continue to protect all personal information to the best of our ability. In order to use one of the above Web sites, a user may first have to complete a registration form. During registration a user is required to give contact information (such as name and email address). We use this information to contact the user about services on our site for which he or she has expressed interest. At several different points on our Web sites the user is required to provide demographic information and unique identifiers (such as, username and password) so that we can provide a more personalised experience on our site. We take appropriate security measures to protect against unauthorised access to or unauthorised alteration, disclosure or destruction of data. These include internal reviews of our data collection, storage and processing practices and security measures to guard against unauthorized access to systems where we store personal data. We restrict access to personal information to Prayer Deliverance Ministries (PDM) employees who need to know that information in order to operate, develop or improve our services. These individuals are bound by confidentiality obligations and may be subject to discipline, including termination and criminal prosecution, if they fail to meet these obligations. We may provide you the opportunity to participate in online surveys on our site. If you participate, we will request certain personally identifiable information from you. Participation in these surveys is completely voluntary and you therefore have a choice whether or not to disclose this information. The requested information typically includes contact information, such as name and email address. We use this information to personalize the site and to get any suggestions for improvement to our services and our site. If a user wishes to subscribe to our free newsletter, we ask for contact information such as name and email address. Out of respect for our users privacy we provide a way to opt-out of these communications. The user will have the option to opt-out included in the newsletter email. We will never publish your deliverance prayer request on our site without your expressed consent or permission. 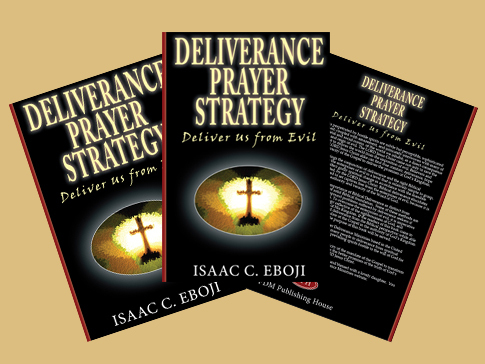 Because we want to honour and respect the wishes of all who submit a deliverance prayer request form, permission to publish your deliverance prayer request must be clearly expressed by you. When publishing permission is granted by you we only publish a summary of information entered in the TEXT AREA Box along with your first name, country of residence and date of submission only. Where no publishing permission is selected by default we do not publish your deliverance prayer request on our website. We may from time to time display personal praise reports and testimonies of individuals giving glory to God on our site in addition to featured testimonies and endorsements of the Word of God, and with your expressed consent or permission we may post your testimonial along with your first name, date of submission and country location. Our website offers publicly accessible blog. You should be aware that any information you provide in these areas may be read, collected and used by others who read them. Our blog is managed by a third party application that may require you to register to post a comment. You will need to contact us or log into the third party application if you want the personal information that was posted to the comments section removed. When you send email or other communications to Prayer Deliverance Ministries (PDM), we may retain those communications in order to process your enquiries, respond to your requests and improve our services. Based on the personally identifiable information you provide us, we will send you a welcoming email to verify your username and password. We will also communicate with you in response to your enquiries, to provide the services you request, and to manage your user account. We will communicate with you by email, and where possible live chat, in accordance with your wishes. Many of the cookies on our site are 'session cookies'. Session cookies allow the site to remember you as you move between pages, such as when searching for information or completing online forms etc. Session cookies are temporary and will be deleted when you leave the site or close your browser. Other cookies, known as 'persistent cookies' are saved on your computer for a set period of time. Persistent cookies are used for a range of reasons, such as helping us to see how people are using our website, which pages are being viewed and how often. Other persistent cookies may be used by websites to suggest content that you might like, such as adverts or YouTube videos. Some of the persistent cookies on our website come from Google Analytics. These cookies collect information about the pages that people tend to visit, the type of browser they use etc. The information gathered by Google Analytics helps us to improve our site and tailor it to our customers' needs. We only use this information for statistical analysis purposes, we cannot recognise you from the records we hold and cannot access your computer or any information about you. You can find out more about the tool we use for this and how it works on the Cookies and Google Analytics website. There is also a Google Analytics opt-out browser add on that you can download which enables website visitors with the ability to prevent their data from being used by Google Analytics. This website does not store any information that would, on its own, allow us to identify individual visitors without their permission. Most internet browsers automatically accept (or 'consent' to) cookies, but you can usually change your browser settings to decline cookies if you prefer. However, some cookies on this site are essential, and the site won't work as expected without them. These cookies are set when you submit a form, login or interact with the site by doing something that goes beyond clicking on simple links. If you wish to remove any cookies that have been set by this site, including the consent cookie, you should clear the cookies using your browser’s settings. To find out how to do so, visit aboutcookies.org. We also use social media buttons and/or plugins on this website that allow you to connect with your social network in various ways. For these to work the following social media websites including; Facebook, Twitter, Google+, LinkedIn, and ShareThis will set cookies through our website which may be used to enhance your profile on their website or contribute to the data they hold for various purposes outlined in their respective privacy policies. We use a payment processing company PayPal to process donations and to bill users for goods and services securely on their server. PayPal do not retain share, store or use personally identifiable information for any secondary purposes. Personal and sensitive information (such as name, address; credit and debit card detail) is encrypted and is protected with the best encryption software in the industry - SSL. While on a secure page, such as our payment form, the lock icon on the bottom of Web browsers such as Netscape Navigator and Microsoft Internet Explorer becomes locked, as opposed to un-locked, or open, when users are just ‘surfing’. Prayer Deliverance Ministries (PDM) reserves the right to remove any link or hyperlink at any time and without notice and shall not be obliged to give a reason for doing so. If you become concerned about the content of a site linked to or from the site (or anything on the site), please inform the Prayer Deliverance Ministries (PDM) immediately by email. No email addresses obtained from this site may be used for unsolicited mailings (junk mail), nor do we supply email addresses obtained meaningfully through filling any of our web forms to third parties.